Hiking News: Do you have news about hiking events that you would like for us to post on our website? Please feel free to send any hiking news that you would like for us to share, to our email address at ABhikingblog@gmail.com. We are more than happy to inform our readers about charity events and other outdoor related activities. Photographs of Wildlife: If you have photographs of local Southern California wildlife you saw while hiking and would like to share them on our website please send photographs to ABhikingblog@gmail.com. Also, feel free to share them on our Facebook Page. We suggest that you indicate the trail where you took the picture. Product Reviews: If you have any products that you would like for Ashley and I to do a review of please email us at ABhikingblog@gmail.com. Click HERE for a list of products we have already reviewed for our readers. Recommend a Hike: When making a recommendation of a hike we should do, please post in the comment section below or either by emailing us at ABhikingblog@gmail.com. Please provide directions to the trailhead and any description you think that would be helpful to us. Thank you for taking the time to suggest a trail! Contact: Please feel free to contact us at ABhikingblog@gmail.com if you have any feedback or comments for us. We try and provide the best information about hikes that we have done. Feel free to email us with any suggestions you might have. Post Comments: Ashley and I encourage and welcome our readers to submit comments about their experiences on the hikes on this blog or about their hiking experiences in general. *Site policy on Comments: All comments require administrator approval. Comments will not be approved if they are not related to hiking, the blog, the outdoors, etc. No inappropriate material will be allowed to be posted to the site. Bottom-line is please keep things hiking/outdoor related. 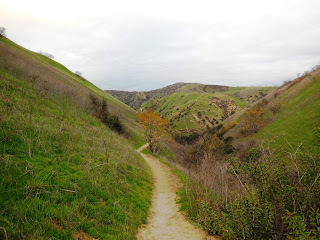 Hi, have you hiked Peters Canyon Regional Park? It's minutes away from Irvine Regional Park. I was there this past weekend and was surprised how much I enjoyed it. It's a little gem tucked away in the middle of Orange County. There's a man made reservoir, a nature trail, lots to enjoy. It was a little dry being that it's summer, so I plan to return in the spring when it's greener. Thanks for the feedback, we have not visited Peters Canyon, but it is on our list of places to visit. Hello, I was wondering if you have a list in excel or CSV format of all the parks that can be uploaded as a POI onto my GPS? Thanks. Great website. I am sorry to say that we don't have a list in that format. Thanks for the suggestion and the comment. Hi was wondering if you no if the gate to saddleback mountain is open to drive up to summit or if you no of a # that i can call. I don't know if the gate is open, as there a couple of gates/options to gain vehicle access to the top of Saddleback, but there is a number on the Cleveland National Forest Website that would probably be your best bet. There is a link below to their website under our "Website and Blogs" section on the right hand side of our website. I'm a big fan of your hiking site. Very useful information for my hikes! Have you ever been to Chantry Flats? Take the 210 freeway (East of Pasadena) and exit Santa Anita Ave and head north. Just go to the end of the road and try to park at the top. If not, you have to find parking and the street and hike up. There are different trails you can take. Sturvetant Falls is about 6 miles round trip and Hermit Falls is around 4. Hermit is my favorite because there are water pools you can jump into, natural water slides, and cliffs you can jump off. Its in the Angeles Natural Forest so make sure you buy an Adventure Pass for your car. Keep up the good work. Thanks for the comment and for the suggestion of the hiking location. It is on our list and we will hope to make it out there soon! Have fun on those trails! Thanks sooo much for your website! I'm visiting the area and this is a superb resource. Is there a feature on abhiking.com for hikes that would be appropriate for female solo hikers? Or could you make recommendations? Thanks again. Hi, I wasn't sure where to post this question. I'm training to hike across the Grand Canyon early next year. I need a pair of comfortable water proof hiking shoes. Can you recommend a good brand? Thanks. As far as comfortable waterproof breathable hiking shoes you cannot go wrong with either Merrell's or Columbia's. Ashley and I have both and use both. We use our Columbia's more than the Merrells. Good luck on your Grand Canyon Hike! Just happened upon your blog and it is MORE THAN PERFECT for what I have been looking to find in OC. We are fairly new here and have two young daughters. Your details are extremely helpful about how and where to get started. I am incredibly excited and grateful to you for putting this together. Thank you! Great Site! I am the founder of www.Trails360.com which covers hikes in Utah and Arizona. I have a few of my users that are looking for hikes in California so I am going to send them to you! Any tips on hike training? Bommer Canyon is on our to do list and thanks for the suggestion. The best tip we have on hiking training is being persistent and getting out on the trail! What Kind Of Geological Observations Related To Erosion Or Deposition Of Oak Canyon?! Hi Brian and Ashley, my husband and I met you on the Ortega trail today. Great hike! Want to go back when it is cooler and maybe not with our dog. We didn't go to Sitton Peak with him. He is an older doga and was too tired. So glad to meet you both. Love your site. Great information! Deb & Gerry, it was a pleasure meeting you on the trail today! We are glad that you have found our website helpful and thank you for the wonderful comments. Have a great one and we hope to run into you guys out hiking again. I am wondering what handheld GPS are you using to during your hikes. I am in the market for one so I figured I ask what you recommend. hi... What's the best hike you would suggest in Orange County? Thanks for this wonderful hiking site! It has been so helpful to me as I am new to hiking. I have a question. I was looking at your post on Riley Wilderness Park and you said you saw a lot of wildlife. I was wondering what time of day you did the hike? I usually prefer early morning but was wondering if there is a better time of day to view wildlife. Thanks so much! Would you consider adding gpx downloads of the trails?